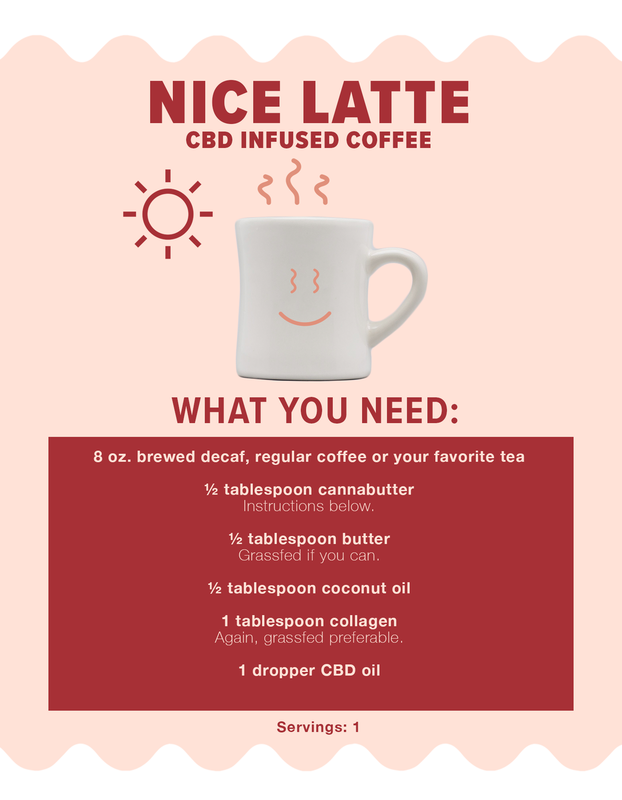 This month, we want to show you two ways to use CBD and THC: both to start your day and to wind down after a long one. For those of you in legalized states, there are a host of curated, artisanal, ready-made THC products you can easily drop into this recipe if you don’t feel like DIYing. For those of us in non-legalized states, or for anyone feeling their inner Julia Wild, get yourself a LEVO. While you absolutely can make weed-infused cannabutter sans gadget, without getting all Bill Nye on you guys, it’s a science, and we’d rather leave that science to a (cute) (and precise) machine. Important note: Cannabis ingested orally (i.e. food, edibles) can take anywhere from 30 minutes to two hours before the effects are fully felt. It depends on your metabolism. If you have a blessedly quick metabolism, you should feel it quickly. If it’s slower, you’ll be that person who says, “Hey, I don’t feel anything” and then two hours later are telling a different tale. Five milligrams is a pretty low dose for most people, so you should expect to feel a nice, mild buzz. Our recommendation, if you’re new to this and don’t feel anything, is to leave it alone and try again tomorrow. If you’re having issues with your recipe, you can let us know here and we’ll troubleshoot. In the morning, decarb your cannabis so it’s ready to go when you get home after work. Once you get home, make your infused honey by pouring 2 cups into your LEVO (if you don’t have a LEVO, try this method) with 3 grams of decarbed cannabis (we recommend the classic strain Granddaddy Purple) and set the machine. It can take over an hour for the honey to infuse so make sure you start this a few hours before bed. Once the honey is ready, boil your water. While the water is boiling, add the valerian root concentrate into your mug. 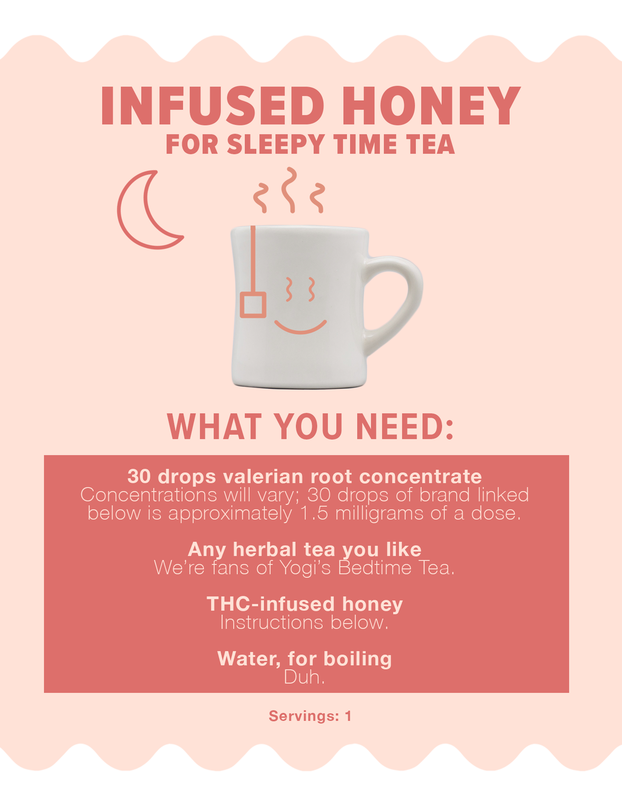 Valerian root is an ancient remedy for insomnia (think Hippocrates-ancient-Greece ancient) and with the addition of medicated honey, you’re in for a good night’s rest. Once your water has boiled, add water, your teabag, and 1 tablespoon honey into your mug. As mentioned in the last recipe, it can take a while for this to kick in. For nighttime, we recommend 10 milligrams of THC to feel nice and relaxed. If you’re new to this, don’t drink and plan to do something really arduous or complicated afterward. Have a recipe you want to see? Questions? Talk to us.